:) I love the list. I am still the girl who makes mixed cds for friends even though they act like they don't know what to do with a CD any more. I love Ed's song. I am still so bummed I missed his show last night in Vegas. Type in "Ed Sheeran - iTunes Festival 2012 [Full Set]" to Youtube and there's an entire concert of his online from last year! How fun is this! You look Gorg! We have similar music taste as well. Happy Vday love, hope you have a fab day! Gone, gone, gone is my favorite song of the moment! Keep on rocking, pretty girl! Great list! Music has always been one of my favorite ways to give and receive gifts! such a great idea! The rose, the love sign and the dress...perfection! such a fabulous mix! love give me love so much! :) also i am sucker for hearts and red tights so i am swooning over this outfit. i would prob wear it any day of the year! Angus and Julia for the win! Love this list. Also, adorable V-day outfit! I think they would look awesome in black and white too! Great list here and these pictures are just adorable - happy hearts day! great choice of music and a good idea! and a lovely idea. I love your dress and tights and that big rose! so cute! pretty much the cutest thing i've seen in awhile! GIRL! You nailed this! 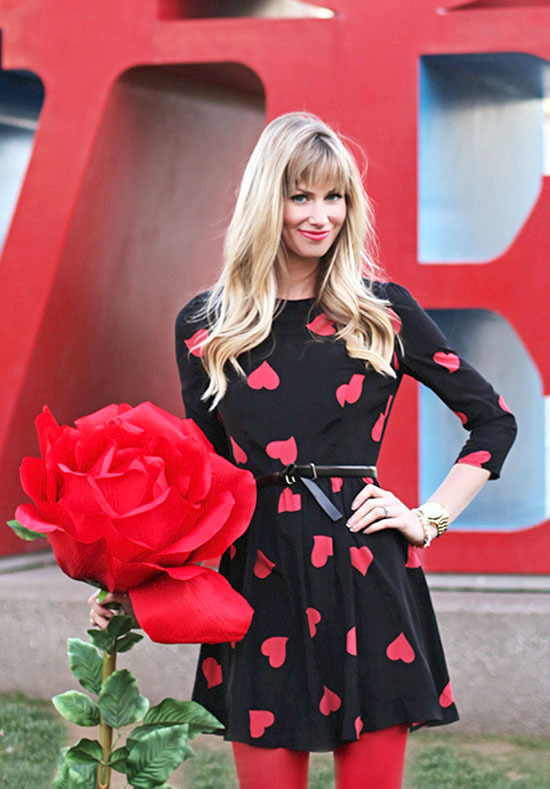 The LOVE statue... giant rose... heart dress. Way to go! Adorable! I LOVE this dress and the photos are so cute! So excited to follow your blog. These pictures are fabulous & you llook gorgeous!! Great playlist! You look like a pretty little valentine yourself in all that red/hearts! Love your dress! That giant rose is amazing!! You look beautiful! I love Ed Sheeran. Happy V-Day! My gosh, that is the biggest rose I've ever seen! :) Happy Valentine's Day! what a perfect backdrop for today!!!! These photos are absolutely gorgeous! I found your blog through the $1,500 gift card giveaway (I would use the money towards a new MacBook) and I am so glad I did, I love it and I am now following you! Happy Valentine's Day! note to self: need giant flower. loving your hair in these pictures, you own it! and music is the best, love your mix. happy vday! How fun is your outfit and that HUGE flower! You look gorgeous! This is SO cute!! I love the huge flower. Happy Valentines Day! Aw, this is such a great location for the post! I'd love to visit some day haha! amazing amazing pics!!! that rose is HUGE!!! I have never heard some of these songs... thanks for the introduction! Yep, definitely all about the love music for Valentine's Day! Great list girl, especially Phillip Phillips, Ellie Goulding, and Ed Sheeran! And let's not even talk about how absolutely precious you are in these photos. Loving that big rose! This is the perfect Valentines photo shoot! Hope you had an amazing day! so cute with that prop--- glad you are back to blogging! Beautiful pictures!!!! Your life always looks so fun and interesting to me! Have a great day!